A simulation in which students, representing UN member states, meet to find solutions to common problems. It offers a world of opportunity where concepts and principles from the classroom can come to life. Join us and change your world. While focusing on role-playing an “adopted” country, students in grades 7-12 exercise the arts of compromise and diplomacy to attempt to solve pressing global problems. As students simulate international organizations, they begin to find new answers to tough questions, to learn and respect opposing points of view, and to utilize the tools of peaceful change. This program creates a working replica of the United Nations, conducted almost entirely by students. 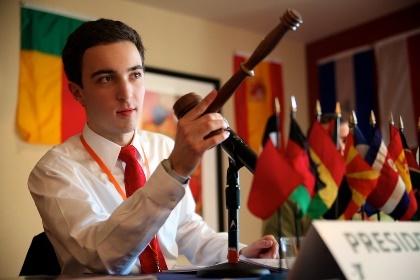 Students can participate in a model General Assembly, International Court of Justice, Economic and Social Council, Security Council, Human Rights Council or Conference Newspaper. There are two parts to the cost: the State Fee and the Delegation Fee. My time at MUN was awesome. There are many reasons why I like it. The committees were great and we had great discussion. If I could go again next year, I would!